It took two hundred years for the well to do of Manhattan to migrate uptown from the foot of the island to frontier of 59th Street, and even then they weren’t completely sure that living so far uptown was the proper thing to do. 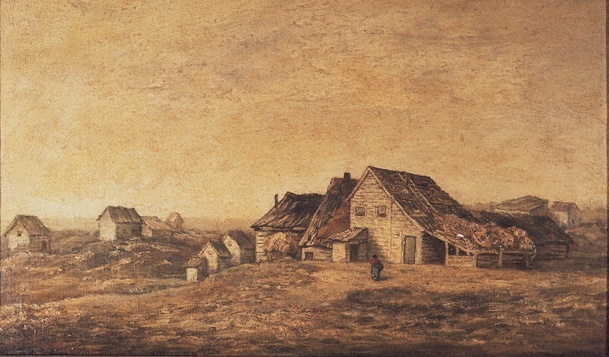 In the beginning, in the mid-seventeenth century, when settlement began, wealthy residents of New Amsterdam kept neat homes of brick and wood. 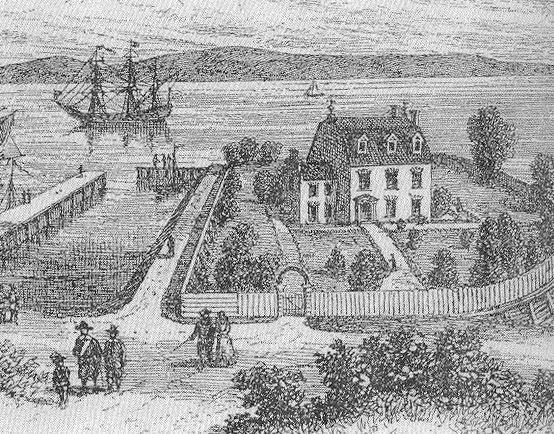 The only residence approaching grandeur was White Hall, the English name for the house Peter Stuyvesant built at the southern tip of the island, with its stunning view of New York Harbor. In those early days, before Fifth Avenue had been laid out, a fashionable address for the wealthy meant Bowling Green, after which people who could afford it moved up Broadway through Murray and Chambers Streets, on to Washington Square. Until the Commissioners’ Plan of 1811 cut regular streets through the city (155 cross streets and 12 Avenues) the start of Fifth Avenue was farmland, as was almost almost all the property north of Canal Street. The name Fifth Avenue appeared for the first time on the Commissioners’ map. No one imagined that the thoroughfare would one day stretch six-and-a-half miles up the island. 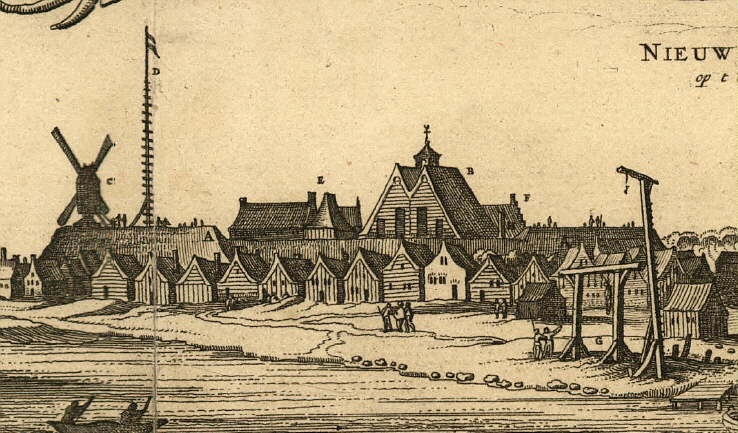 But the street was spacious and straight, and Manhattanites began to build townhouses along it; within two decades church steeples rose on either side of the street, Belgian blocks were laid for paving, and New Yorkers had begun to promenade along its length. In 1828, the city opened Washington Square at Eighth street at the base of Fifth Avenue, a tract that had been used since 1797 as a potter’s field. Gracious homes went up around the square. In 1825 the new gas lamps came in south of 14th street; by 1847 they extended up to 18th street. 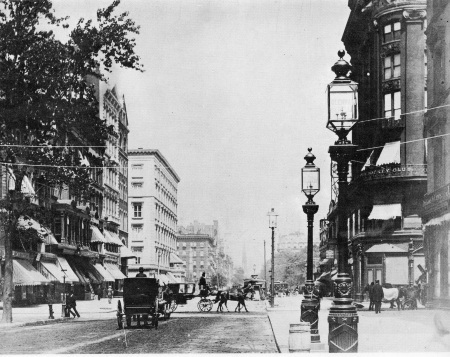 Now lower Fifth Avenue became the fashionable locus of New York. One of the first of the home builders was Henry Brevoort, who inherited all the farmland around from his father and built a luxurious five-bedroom house with iconic columns and lilacs and rose of sharon blooming in the front yard behind an iron fence. The house stood until 1925. Other fine homes followed, surrounded with yards and gardens, backed by stables. The ambience was quietly fancy, unprepossessing. In 1851 a study found that below 23rd Street on Fifth there were still 32 vacant lots, and fifteen others were described as “now building” No matter. When Delmonico’s, New York’s premier restaurant, opened in a shipowner’s home at 14th and 5th it was clear the neighborhood had arrived. The custom of the leisurely promenade continued, and with it the practice of making calls. Fifth Avenue was a social place. The move of peoples’ homes uptown was unstoppable if somewhat slow paced. For one thing, the street was still being built. Fifth Avenue did not cut through to 23rd St until 1837, and it was still surrounded largely by countryside, crisscrossed with streams and studded by ponds. Fifth Avenue was surprisingly rural. Stagecoaches stopped at a tavern on 23 Street called Madison Cottage. 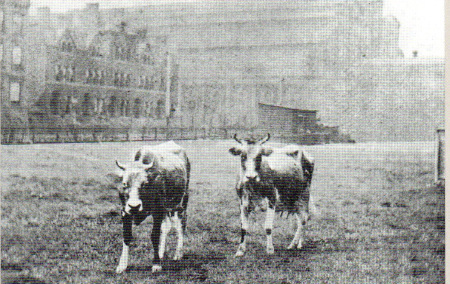 Cows wandered in front of that day’s incarnation of Grand Central Station. The city’s livestock market took place nearby, and cowboys drove herds of cattle through what we think of now as midtown. Then handsome houses, some sheathed in brownstone, began to rise. The New York Herald named 200 of the city’s most important men in 1851, and half of them lived north of 14 Street. Madison Square was now becoming the center of the city’s professional class. 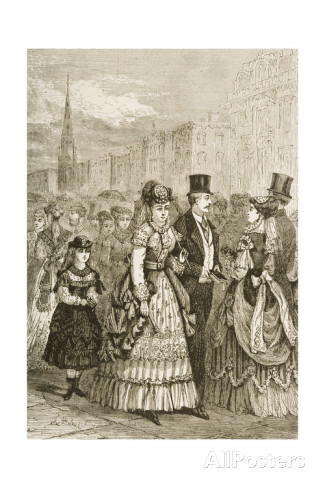 Fashionable clubs opened there, the Union in 1855, followed by the Athanaeum, the Manhattan, the Lotos and others, along with refined academies for young ladies. The first tycoons to make the move were William B. Astor, Jr. and his brother John Jacob III. Thirty-fourth street was a good distance uptown from where the family had traditionally settled, down around Lafayette Street. The Astor houses, separated by a garden, were relatively modest, brickfaced, with rustic columns. Nearby stood the mansion of Samuel B. Townsend, “the Sarsparilla King,” and on the same site after his death the grandiose, 55-room marble palace of Alexander Turney Stewart and his wife Cornelia, built in the late 1860s. Stewart’s department store on Broadway between 9th and 10th Streets landed him among the wealthiest Americans, and ushered in a new age of lavish consumption. The die was cast. 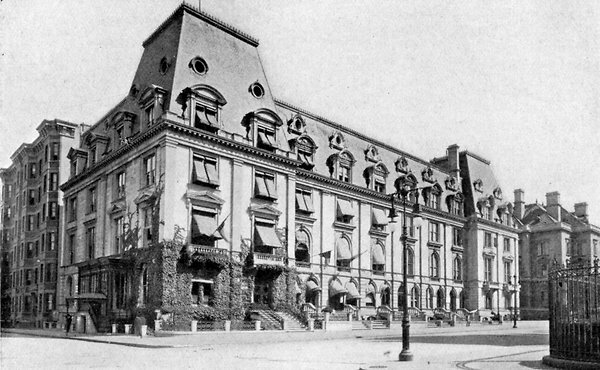 In the next two decades Fifth Avenue up to 42nd Street became an almost unbroken parade of handsome brownstone mansions on 25×100 foot lots, not as large as the Stewart house but occupied by well-to-do, successful New Yorkers and incorporating all the trimmings, from gas lights to running water to fully equipped bathrooms. Chocolate in color, brownstone was quarried in New Jersey and cut into sheets that were applied as a façade to wood, for a uniform appearance that some found grand and others dull. 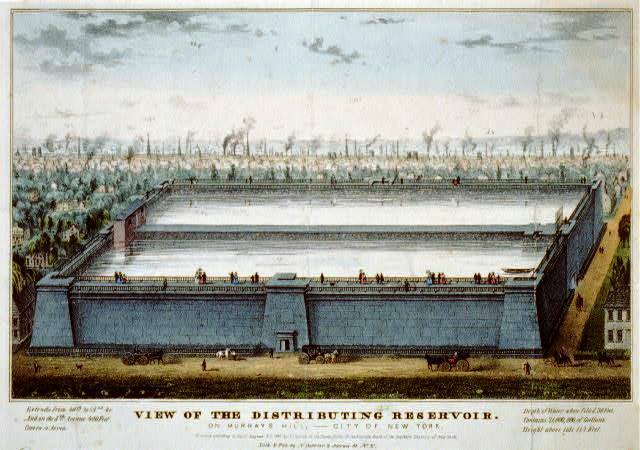 Strolling along the avenue was extended upwards when James Renwick designed the gargantuan Croton Reservoir (also referred to as the Murray Hilll Distributing Reservoir) at 42nd Street in 1842, and ran a promenade along the top rim of its forty-one- and-a-half foot high slanted walls. The walkway became a hit society destination. You could get an ice cream afterward across the street at Croton Cottage. North of the reservoir stretched the undeveloped city. 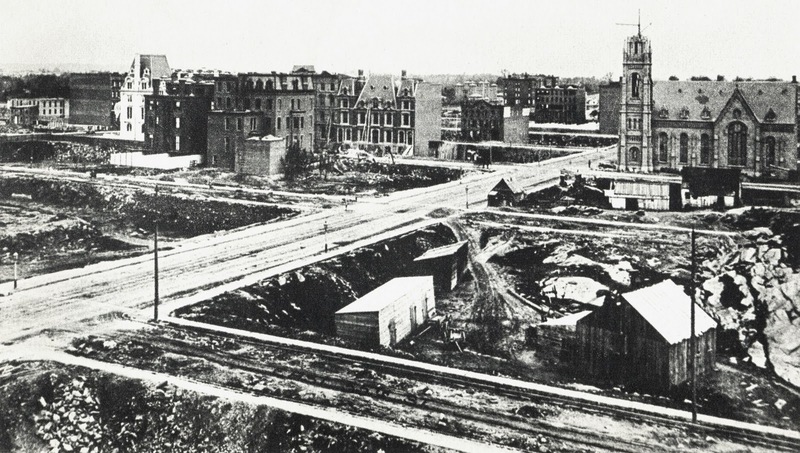 If you look at a picture made in 1863, facing south from the site of what would become Central Park, you can see the still-pastoral nature of uptown. Fifth Avenue, to the left, heads determinedly north, flanked by buildings in its lower reaches but by nothing but fields and cattle farther up. A few homes dot the landscape, but more dominant are the ungainly freestanding charitable institutions that would not be accommodated farther downtown. You can see the massive shapes of St. Luke’s Hospital, between 54th and 55th Streets, and the Deaf and Dumb Asylum. Behind St. Luke’s stands the Colored Orphan Asylum, which was attacked in the horrific week-long Draft Riots of 1863 (five years after this image was made). Saint Patrick’s, the landmark we associate with midtown Fifth Avenue, was not begun until 1858. To give an idea what the surroundings were like, consider Madison Avenue, a block over from Fifth, as it made its way north from 55th Street around this time. A thirty-acre farm owned by the prosperous Lenox family dominated the neighborhood, with a stolid white tenant farmhouse located between 71 and 72 near Fifth Avenue. Cows grazed nearby and market crops grew in rows. Lying on the outskirts of town this far north were slaughterhouses, stockyards and tanneries, enterprises fashionable downtown did not want near their homes. 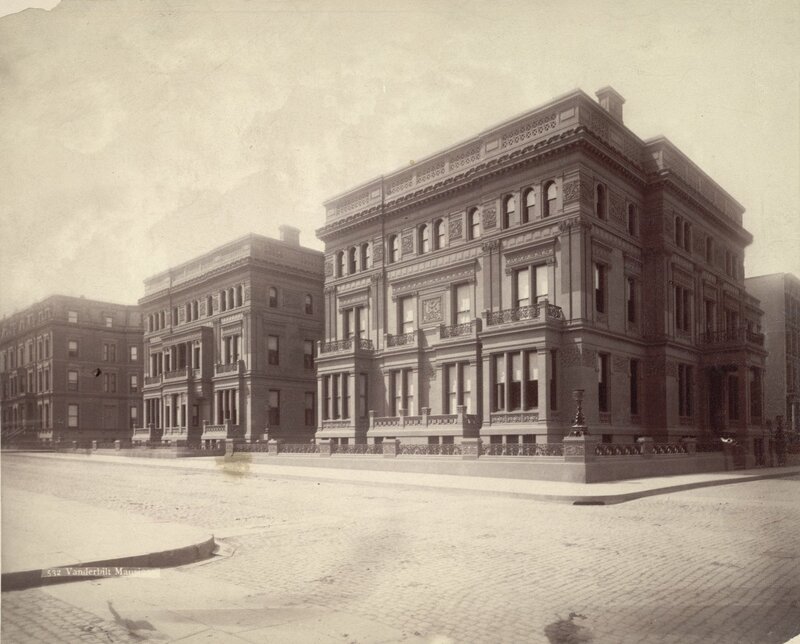 The Lenox Library, a handsome block-long structure designed by star-architect Richard Morris Hunt, went up in 1875 at Fifth Avenue and 71st Street, an outpost of civilization. As of 1865, the city was moving uptown. New Yorkers took the air on Fifth Avenue, promenading as always with vigor. The Easter Parade was only one opportunity to admire and be admired. But while the upper tens (the equivalent of today’s “one percent”) of New York built their urban villas and stolid townhouses to the south, wide open stretches of the boulevard north of 60th Street still seemed off limits for luxury development. At the time of Savage Girl, 1875, more than 340 private residences had been constructed up to 59th Street but none above. The lack of elegant homes didn’t mean people didn’t live there. Those precincts had long been settled by African Americans and German and Irish squatters who occupied shanty towns where the principle businesses were bone boiling, glue, soap and candlemaking. Eventually they were eliminated from the area both by the development of Central Park and rising real estate prices. Edith Wharton remembered the area as dominated at that time by “the hoardings, the quarries, the one-story saloons, the wooden greenhouses in ragged gardens, the rocks from which goats surveyed the scene.” North of the site I gave the Delegate house, it was still this old, bucolic, rough-hewn New York landscape, unrefined, undeveloped, not yet buried in the smooth cement of the new. Central Park, built in the 1860s and opened officially in 1873, made inroads in “civilizing” the neighborhood; but it still seemed too much like a savage wilderness for the upper crust to build there. There were a few exceptions, wealthy home builders that for their own reasons decided to go above 42nd Street. 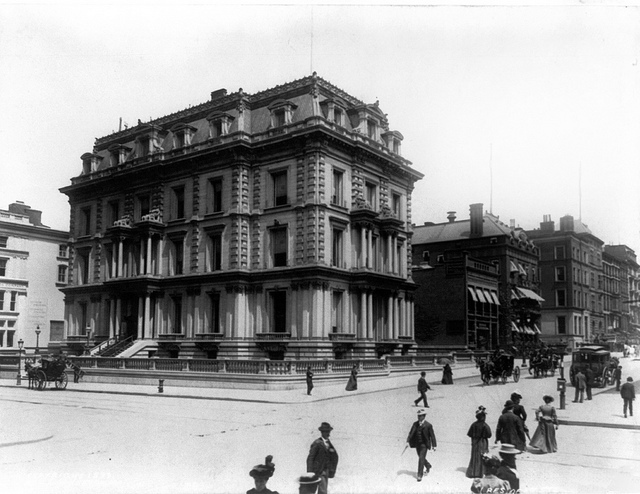 Robber baron Jay Gould built a residence on the corner of 47th and Fifth in 1870. The infamous Madame Restell and her husband moved in at the northeast corner of 52nd and Fifth in 1864. But mansions towered over shacks. Mary Mason Jones, a distant relation of Edith Wharton’s – personified in The Age of Innocence by Mrs. Manson Mingott — built a row of mansions on Fifth Avenue bet. 58th and 57th Streets, completing them in 1870. A remarkably independent, wealthy, well-travelled woman, she had had the first bathtub in New York installed in her home on Chambers Street, and her choice of venue for her new residence was equally offbeat. Five homes were constructed of gleaming white marble, with a two-story mansard roof that had green copper trim. 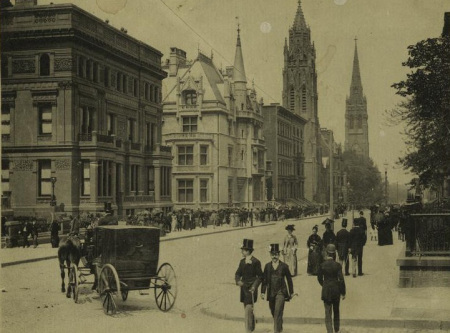 By the time the fictional Delegates settled into their house in the early 1870s, the intersection of Fifth Avenue and 63rd Street was still quiet, devoid of built structures, undiscovered by Knickerbocker Society. The Delegates were pioneers. I decided to situate them there because the choice makes them outliers, risk takers, iconoclasts in a society they see as conformist. I wanted to show them as the first to build a grand residence there, one that would outshine all the others in the city. 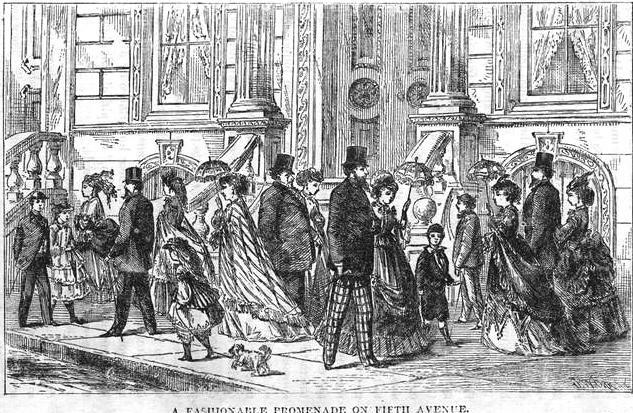 Eventually, Fifth Avenue upwards of 59th Street would be lined with mansions that were even more extravagant than the homes built in the avenue’s lower reaches. When people passed, they would gape at at the welter of materials and styles, the polished marble, dramatic gables and steep-hipped roofs, puncuated by balustrades and moats and massive chimney stacks. Whether architects hewed to the gleaming white symmetries of the Beaux-Arts or the swagger of the Moorish fortress or the period’s beloved French Renaissance design idiom, their creations lorded it over the somber-faced brownstones of the cross streets. I couldn’t resist borrowing from some of the later residential masterworks to design the Delegate house, even though they would not be erected for a few more years. The various Vanderbilt homes offered the kind of opulence I felt the Delegates would emulate. After inheriting an estate of nearly 100 million dollars from their shipping-and-railroad-magnate father, the Vanderbilt descendents put on a grand architectural show. 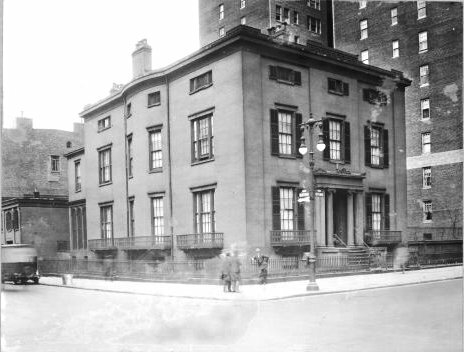 William Henry Vanderbilt, the Commodore’s eldest son, built triple houses for himself and his daughters between Fifty First and Fifty third Streets. 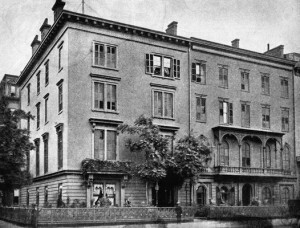 William K. Vanderbuilt, William Henry’s son, had Richard Morris Hunt design him the mansion at the northwest corner of 52nd Street that was the setting for a famous fancy-dress ball of 1883. 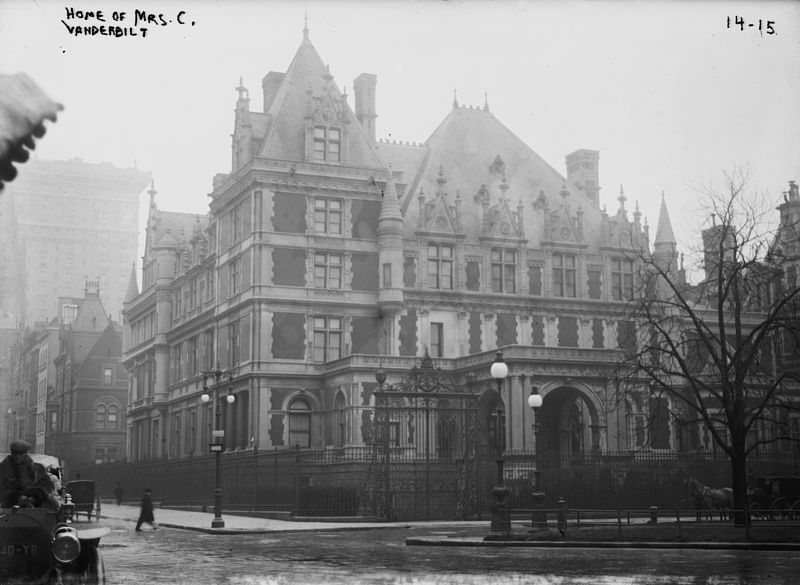 I was especially impressed by the mansion Cornelius Vanderbilt II put up at 58th Street and 5th Avenue in 1883, the largest private residence ever built in New York City. A full block long, designed by George B. Post, it stood sentry until 1927, as one mansion after another followed it up the avenue. Actually, I’m being slightly inaccurate. For the record, in the early 1870s one house did stand on Fifth Avenue at 63rd Street, above the 59th Street divide, just across the street from the still forbidding Park. A narrow townhouse circa 1871, it was built speculatively built by one Runyon Martin, hardly a mogul. It didn’t last long. The Delegates knocked it down to put up their turreted, mulberry-colored, block-long twin palaces. There is a great book called Mannahatta that shows New York as it looked just before Europeans arrived, very interesting and suggestive of what it might be like if we all decamped. I sometimes wonder how long it would take for this area to revert to forested glades if left unpeopled. Not that I ever want to see this happen, but it would be interesting.